Okay, I've decided to write a blog - one of those things I've been meaning to do for longer than I can remember. Now this isn't going to be the most exciting blog in the world, but you never know - it might well be useful to somebody. I'm going to start off with a little project I did recently. I'm into functional programming, but am acutely aware that there is a performance penalty associated with anything immutable and/or recursive. In recent years there has been substantial effort in optimising compilers and VMs for functional languages, and performance is approaching that of more conventional imperative mutable languages. Now, I've got a whole brain full of ideas I want to try out, but just for fun you understand. However, as a man who feels fluent in several languages and competent in at least a dozen more, I've decided to try and pick one and try and master it fully. Of course, this won't happen, but it's at least a worthy goal. In this post I'm going to tackle the first item. 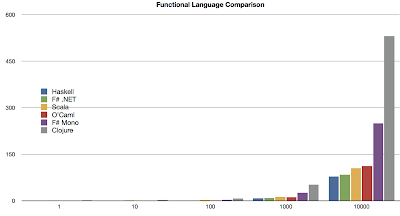 There is the famous Computer Language Benchmarks Game, but this hampers functional languages in certain ways, for example it doesn't allow lazy evaluation. So, instead I put together my own little benchmark. Now, I admit this is fairly simple and it doesn't use some functional features such as currying or lazy evaluation; however it does use recursion and immutability. Also, I've tried to keep the code idiomatic but still following the same basic algorithm each time. It would be possible to do optimisations in each language or be more idiomatic (by modifying the algorithm) but I avoided this. The problem to solve is a simple one - there are 10 people with 500 places to visit (this is stored in a CSV file), however they can only visit 10 each. I use a brute force method of finding possible journeys, basically recurse through each resource in turn, then choose the 10 nearest places in turn (using the Haversine formula). I then fold this to get a total travel distance, which I ensure is the same across each implementation. This makes good use of recursion, some heavy lifting with fold/map, some file access and a bit of simple trig. Haskell is the fastest but Scala seems to be accelerating in performance. HotSpot compiler maybe? The F# performance is a lot better on the real VM and on the new SGen GC. Clojure is strangely slow, but I'll cover why I think this is the case in a later blog. The native compiled languages show a very quick 1 iteration time. Clojure has the longest 1 iteration time, but this is to be expected. They are all very similar on number of lines, however each implementation is very similar in code. The memory usage was significantly (as in 1/100) lower for Haskell and O'Caml - although I didn't measure this precisely. I'm not sure there is one, all the languages I tested are close enough to be interchangeable with the exception of Clojure (which I'm going to cover in a different post). Which language did I find easiest? F# - the IDE and debugger makes such a difference. The hardest? Haskell, but once I'd got it to compile it worked first time. To make it clear, here is a quick graph I've put together a table (the top number is iterations) and a graph. Clojure poor performance - why?